This article is 2574 days old. Motors started running this past Tuesday in anticipation of this year’s 2nd Annual Bob Probert Memorial Ride in support of the cardiac angioplasty program at Hôtel-Dieu Grace Hospital. 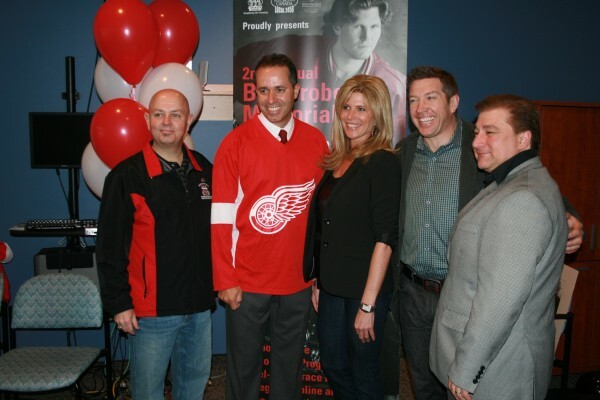 The Probert family introduced their close family friend and Bob’s former teammate and roommate, Sheldon Kennedy, as this years road captain. The Probert Ride is now one of the Foundation’s signature events and one that in a relatively short period of time has created a significant buzz of anticipation within the community. “Events such as this Memorial Ride help to raise funds for and awareness of our cardiac angioplasty program at Hôtel-Dieu Grace. It also does something else very important to our hospital family – it unites us as a community. Our Ride committee, volunteers, Foundation staff, and generous donors all work together to improve cardiac services,” explained HDGH Foundation President and Executive Director Bill Marra. Last year, over 800 motorcycle riders participated in the event and raised over $100,000 for the cardiac angioplasty program. This year’s Ride will take place on Sunday June 24th which corresponds with the jersey number Bob wore throughout his NHL hockey career. Registration for this years ride is available online.